Polson Pirate Bridger Wenzel makes his way into the championship round in the 152 weight class. Isaiah Alik of Mission/Charlo and Hunter Fritsch of Polson get set to battle in the championship match of the 170 pound bracket of the Owen Invitational. Ronan Chief Justin Mays upends his opponent for third place in the 205-bracket. 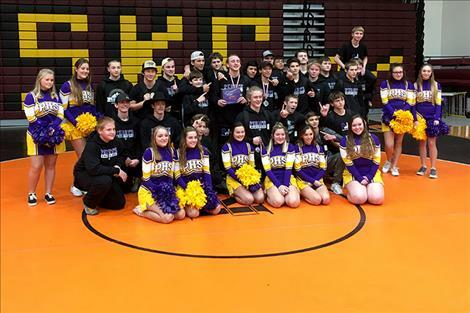 PABLO – The Polson Pirate wrestling team had a nice start to the new 2018-19 wrestling season by winning the team title in the Owen Invitational. The Pirates hosted the tournament at home this past weekend. 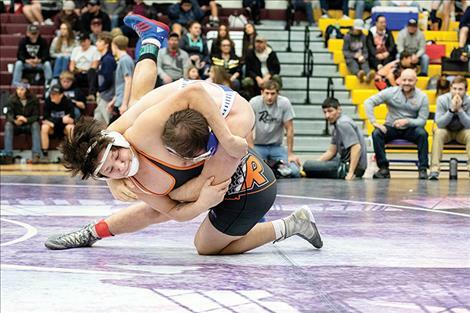 Due to last winter’s snowstorm damage to Linderman gym, the Joe McDonald Health and Fitness Center located on the Salish and Kootenai College campus in Pablo was the site for the 43rd annual invitational. “It was awesome,” Polson head coach Matt Owen said of the new venue. The bigger gymnasium allowed the tournament to flow a little quicker than it had in the past. 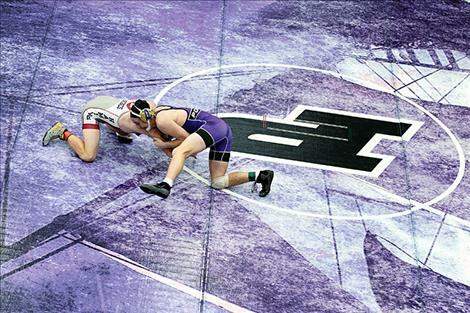 “Being able to throw the fourth mat down definitely sped things up this year. We have never been out of a tournament this early before,” Owen said. In the two-day 20-team event, Polson narrowly edged the Lake City team from Coeur d’ Alene, Idaho, 202-201 for the overall team title on Saturday. The Pirates placed four grapplers in championship brackets, including Hunter Fritsch winning the title at 170 pounds by fall over Isaiah Alik of Mission/Charlo in the title match. Rene Pierre (103), Bridger Wenzel (152) and Logan Adler (182) were runners-up. For the Pirates, Jarod Farrier (132) nabbed a third-place finish, Gavin Knutson (103) placed fourth, both Kedrick Baker (113) and Maysn Cowell (120) placed fifth and Justice Moore (205) placed sixth. Isaiah Alik (170) placed second. Walker Murphy (120) and Darwin Adams (145) added third-place finishes, and Miles Anderson (205) chipped in a fifth place for Mission/Charlo who placed tenth in the team standings with an 89.5-point effort. For the Ronan Chiefs, Justin Mays took third in the 205-bracket and Daniel Collins Bishop (152) claimed fifth. 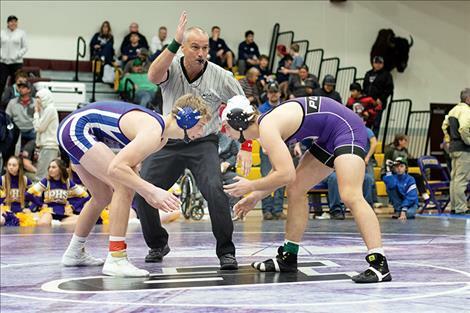 Up next, the Pirates and Chiefs are on the road to Butte for the Mining City Duals on Friday and Saturday, Dec. 7-8, while the Mission/Charlo and Arlee squads head to Superior for the Bob Kinney Memorial on Saturday, Dec. 8.